Forgive the play on words, but gingerbread men these days all live in cookie-cutter houses. They all seem to have the same candy cane fences, gum drop shingles, and frosted trimming. These often square houses lack any creativity or intrigue. But luckily some intrepid bakers have looked to architectural greats for inspiration. 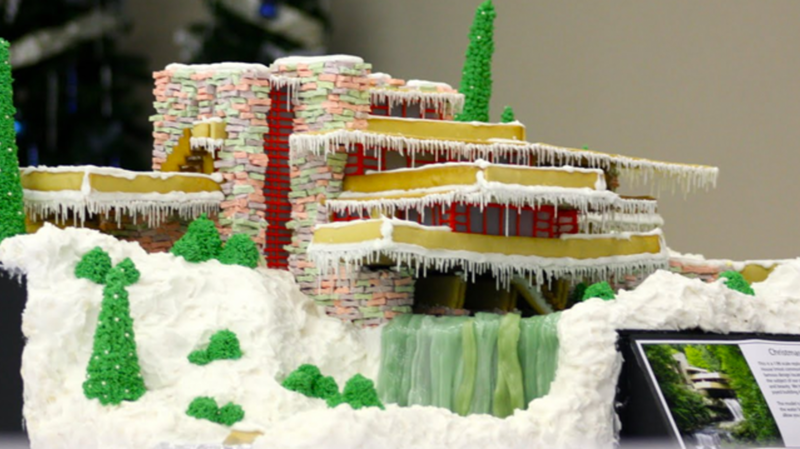 Check out these gingerbread houses based off famous buildings around the world. Back in 2010, culinary artist Melodie Dearden decided to recreate architect Frank Lloyd Wright's famous house, Fallingwater. The artist detailed the construction of her delicious rendition on her blog, Garden Melodies. Using a lot of sheets of gingerbread, and even more frosting, Dearden was able to recreate the home, complete with a candy waterfall. It took 12 hours to design and 40 hours to put together the 164 pieces of house made from roughly 12 square feet of gingerbread dough. And six months later when it was time to throw her creation away, Dearden did what any baking chef would do: She blew the thing up. In 2013, photographer Henry Hargreaves and chef Caitlin Levin teamed up to create famous art galleries out of gingerbread and candy for a Dylan's Candy Bar display at Art Basel. They created a number of different buildings, including the Louvre, the Solomon R. Guggenheim Museum, and the Tate Modern. Levin used plenty of delicious ingredients to recreate the buildings, including gingerbread, cotton candy, and licorice. The duo's rendition of London's Tate Modern included gingerbread, hard candy, cotton candy, and bubblegum. The creation looked pretty realistic, especially when photographed in black and white. In 2007, Chef Beate Woellstein recreated the Houses of Parliament, Trafalgar Square, and the London Eye in gingerbread and candy for the Grosvenor House Hotel. You can also see miniature double decker buses, a telephone booth, and other iconic London fare strewn around the display. The whole thing weighed about 50 kilos, or 110 pounds. For last year's sixth annual Gingerbread Build-Off in Houston, a building team called The Neurons created a gingerbread version of the Grand Budapest Hotel (from the movie of the same name). As per the rules, every part of the structure was completely edible. The piece was so impressive, it won first place. Instead of choosing just one building to gingerbread-ify, chef David Diffendorfer decided to create all of downtown Portland, circa 1913. The vintage cityscape was made for the Benson Hotel in honor of its 100 year anniversary in 2013. The gingerbread city shows what Portland looked like when the hotel first opened. The pastry chef even consulted with the Oregon Historical Society to make sure all the details were correct. The whole thing took about 500 hours of labor and three weeks to complete. Pretty impressive, considering there were 137 buildings, 250 trees, and over 3000 windows.